If you missed the 2013 version of the Orion Music + More fest, which took place on Detroit's Belle Isle over the weekend, we hope this photo gallery will help set the scene. The biggest names in hard-rock and heavy-metal rocked Los Angeles last night, May 2, at the fifth annual Revolver Golden Gods Award Show. 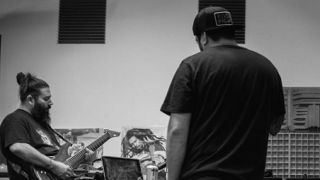 Earlier today, Deftones fans got their first taste of music from the band's forthcoming new album Koi No Yokan. Stream "Leathers" via the SoundCloud player below. After much speculation over the weekend, System of a Down have officially announced a run of North American tour dates with support from Deftones. You can get all of the dates below. Cryptic messages posted on the official Twitter accounts of both System of a Down and Deftones seem to indicate that the bands will announce a co-headlining tour on Monday. Welcome to the second weekly installment of our new music roundup, where we assemble all the new music released over the last week into one convenient place for your listening pleasure.